Denmark Road is a brand new, purpose built student accommodation development in Manchester designed with the needs of the modern student in mind. This accommodation is located opposite the University of Manchester Campus and is fully furnished with all bills included. Yes that’s right, a whole double bed all to yourself! This stylish development features four, five or six bedroom flats, and all rooms are en-suite with double beds for luxury student living. 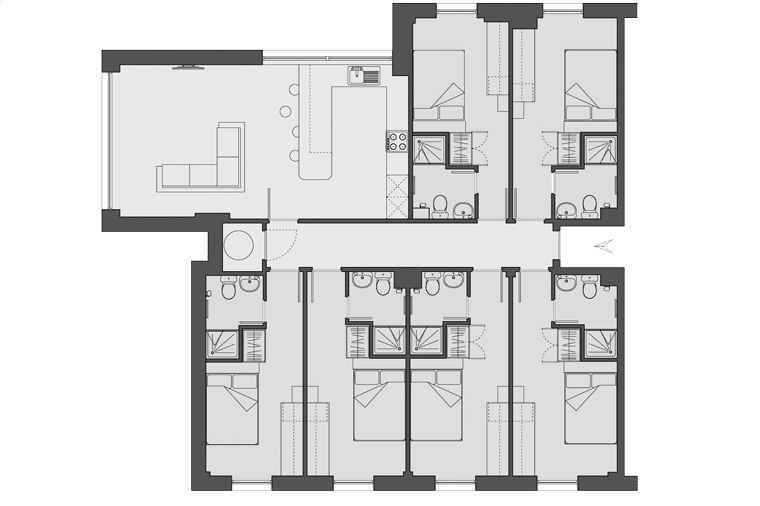 Each flat offers a spacious kitchen/lounge area, modern built-in kitchen appliances, leather sofa and large flat screen television, making it a great place to spend your free time. Further features include on-site laundry, common room/games room, 24 hour maintenance support and on-site security, so everything you need is on your doorstep. This combined with free contents insurance, all inclusive utility bills and 50mbs broadband means that you will enjoy hassle free student living. This new property is on Denmark Road, Manchester, parallel to Oxford Road. We are conveniently placed for both the Manchester Metropolitan University and Manchester University. This great location means that you can make the most of everything Manchester has to offer. Denmark Road student accommodation is ideally placed for studying in Manchester, and is just 2 minutes from the famous Oxford Road, home of both The University of Manchester and Manchester Metropolitan University. The Manchester Metropolitan University Business School is only 20 minutes' walk away. Denmark Road is also just a 20 minute walk away from Manchester's lively city centre, which hosts a wide range of shops, bars, clubs, cinemas and theatres as well as excellent transport links to London and beyond. The iconic Old Trafford Stadium is just a short bus ride away. Denmark Road is also ideally placed for easy student living, with a local supermarket just 5 minutes away and bus links on your doorstep. 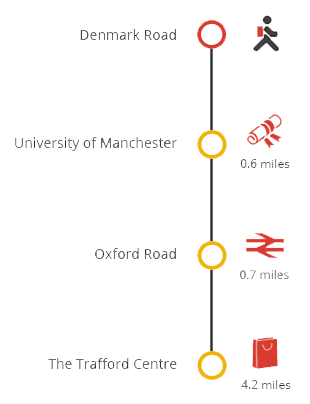 Manchester Oxford Road Station can be reached within a 15 minute walk, and for travelling further afield, Manchester Piccadilly Station is easily accessible. The internet package provided with your accommodation includes a super-fast symmetrical 50Mbs Ethernet broadband service. A further 10mbs building-wide Wi-Fi service is also included. When you arrive please head to the reception at Denmark Road, based at the front of the building. Make sure you bring some photographic ID with you, like your passport or driving licence. Only you will be able to pick up the keys to your room unless you’ve given us full details of the person who will be collecting your keys for you. When you’ve picked up your keys you’ll be given access to our limited parking facilities for 30 minutes to unload your luggage, you’ll then be asked to move your car and use local car parks to allow other students to do the same. Due to the number of students expected to arrive at the same time, please don’t unload your luggage into the reception area until you’ve received your keys. Denmark Road now benefits from LaundryView which will make doing your laundry on-site even easier. The system, created by Circuit, allows you to go online and check the availability of washers and dryers in your building as well as see when other washes are about to end.